Tend Skin® Liquid was developed with No Animal Testing! 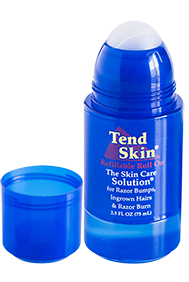 Applying Tend Skin® Liquid after shave will improve the appearance of ingrown hair, razor bumps and razor burns. At Tend Skin Company, we never test on animals. In fact, we are committed to rescue animals in danger. Our company operated non-profit organization, Angels in Distress®, is there to help animals at risk of being killed for any number of reasons. We specialize in wildlife but have our own critters: cats, a rooster and a parrot that we rescued and care for ourselves. Tend Skin® Liquid reduces the appearance of ingrown hair, razor bumps, and redness from shaving, waxing, electrolysis or laser hair removal. Tend Skin® Liquid is great for women after shaving legs, bikini lines and underarms as well as for men who see redness after shaving their faces. No other product in the world can do all that Tend Skin® Liquid does, especially when it comes to ingrown hair and razor bumps. A combination of multiple skin ceramides, the natural compounds found in the skin that account for softness; Urea: Also naturally present in skin. A Humectant that draws water to the skin; And Sweet White Lupin: a prime ingredient used to keep the skin soft. Tweezing damages the skin and makes ingrown hair problems worse. Just lift the end out from under the skin and remove them conventionally by shaving, waxing or electrolysis. Apply thin coat of Tend Skin Liquid twice daily to dry skin, once in the morning after showering and drying the skin. Apply after shaving if you shave. Reapply at night before sleep. This allows the product to work all day and night. Once skin clears experiment to see how little usage you need to maintain. The key point to note is the skin must be dry before applying the product. We all have things that are important to us and that we want to give our best impression. Whether it's an interview, a date, or a job, a clean, smooth shave is a rite of passage that we all should enjoy. Our Tend Skin® Liquid Free Samples are available for the cost of shipping, $1.00. You will ONLY pay for THIS offer. You will NOT be automatically shipped product on a regular basis. We only allow one request per customer as this offer is for people who have not tried the product. Samples of the moisturizer and shave gel are also included.